Description In 2016, a year-long study release by the California State University (CSU) found that 24 percent of our system's 460,000 students were food insecure. To address this issue, and to meet our campus climate action commitments and goals, students, faculty, staff and administrators at CSUN have made remarkable changes to our campus food landscape. In our "city" of nearly 40,000 people, we are creating a more local, sustainable and just food system for all. 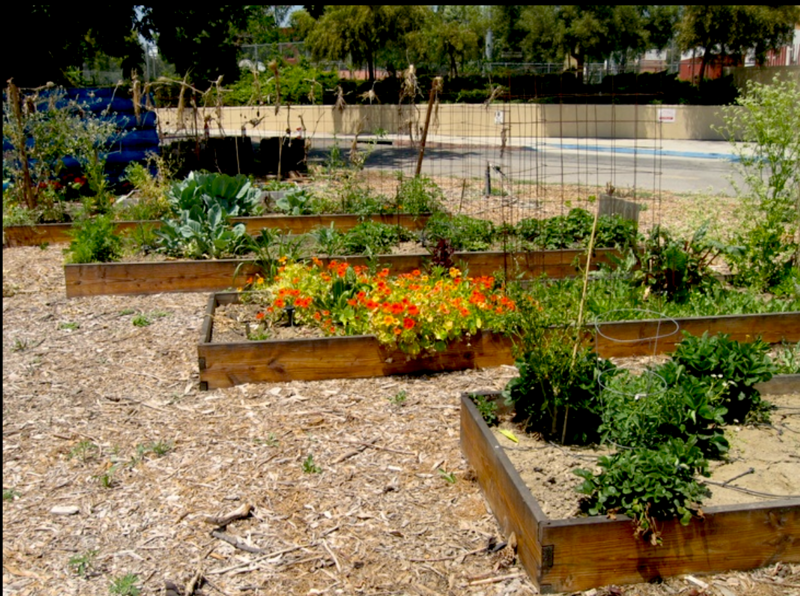 For example, CSUN supports and hosts several organic food learning gardens as well as a native plant pollinator garden that supports the important work of bees and butterflies in maintaining our food supply. The produce harvested from our gardens is donated to student volunteers, to our newly created free CSUN Food Pantry, and to local non-profits that work to feed under-served Los Angelinos. We also offer a weekly farmers market that supports local farmers and food producers while giving our campus and surrounding community the opportunity to purchase healthy and locally grown fruits and vegetables. Food Forward, another local non-profit, visits our campus on a regular basis to pick fruit in our historic Orange Grove. During a recent pick, volunteers harvested more than 10,000 pounds of fruit that would have otherwise gone to waste. Reducing food waste more broadly has become a priority for us in recent years. To that end, we have implemented a food composting program that currently diverts 100% of our pre-consumer waste from the landfill, and the compost we make is used to feed the soil our food gardens. Last year alone, student and faculty volunteers converted over 50,000 pounds of food scraps into 12,000 pounds of soil, scraps that would have ended up in the landfill and eventually creating methane gas. Instead, the waste is being used in the gardens to grow more food. In addition, we have implemented a post-consumer waste composting program that is quickly growing, and takes not only food waste, but also all of the compostable cutlery, plates, cups, coffee lids and food containers that we use in our dining facilities. These composting program are helping us meet our goals of offering zero-waste dining facilities on campus. Still, managing waste isn't easy, as it comes in a variety of forms. 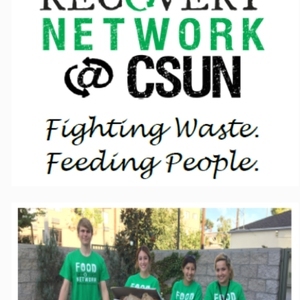 To reduce food waste and feed those in need, students organized to charger a campus chapter of the Food Recovery Network at CSUN. Volunteers recover unsold prepared foods left over at the end of our business days--food such as bagels and pastries, salads, sandwiches, and many other perfectly edible foods. In the last 3 years, this group has recovered more than 15,000 pounds of edible food and delivered it to hungry students and local food banks, and this year we’re on track to double our collection efforts. Finally, in addition to the services mentioned above, we offer a Community Supported Agriculture program sourced through a local sustainable farm, a WIC office, nutrition counseling, and many opportunities to become more involved and active both on and off campus. 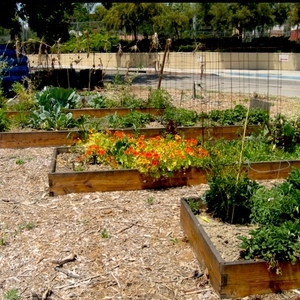 The CSUN food garden was established to educate students about sustainable food gardening techniques and healthy food choices, to promote direct community involvement and provide service-learning opportunities. A food garden working group was started in July 2009. 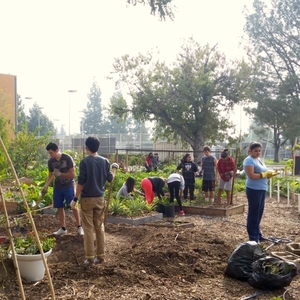 The group met with campus leaders and students to develop the CSUN food garden. 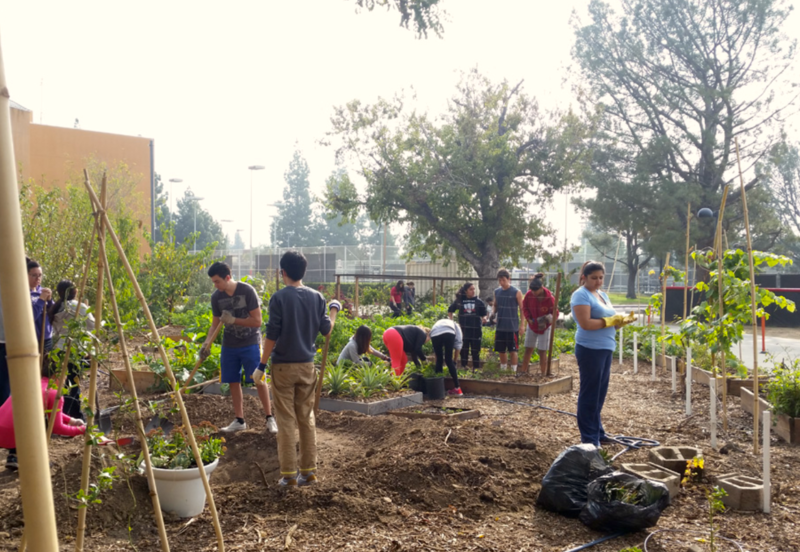 With over 400 square feet of raised beds, more than a dozen fruit trees, and low-water irrigation, all built and planted by student, faculty, and staff volunteers the garden has grown tremendously and continues to thrive. The CSUN compost program was established to reduce campus food waste and to educate students on how food waste can be turned into compost, which can then be used to grow new food. Composting began on a small scale alongside the Food Garden using green waste and small containers. In 2013 the compost program was relocated to its current location. The compost facility began with seven compost boxes that were built using recycled pallets, and has grown to include 17 compost beds. The program consists of food waste pick-ups that are done multiple times per week to all campus-operated dining locations. The waste is then transported to the compost facility to be sorted and put in a compost bed until ready to be used in the food garden. We currently compost 100% of our pre-consumer food waste on campus. 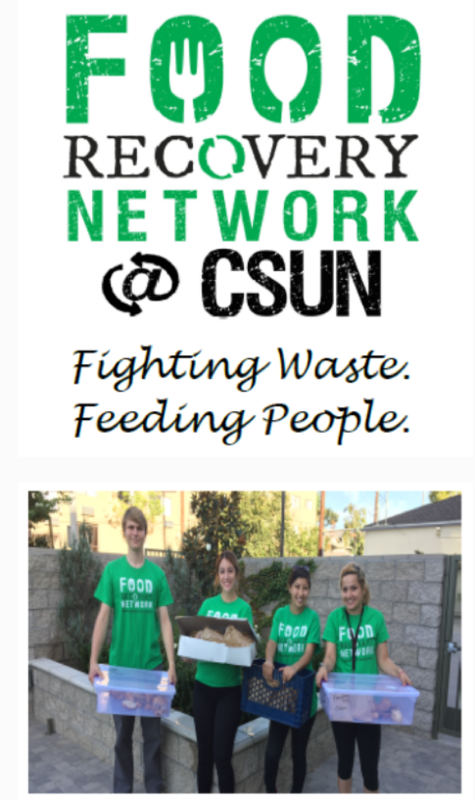 The CSUN chapter of the Food Recovery Network was founded in Fall 2015 by passionate students dedicated to reducing food waste on our campus. They work directly with Dining to ensure end of day recoverable foods are distributed to hungry students and food-insecure community members. The CSUN Food Pantry was also a student-led effort to help reduce food insecurity at CSUN. Surplus food from the Food Garden supplements non-perishable foods offered at the Pantry. At CSUN, we are working to educate our campus and surrounding community about the importance of an environmentally responsible and socially just food system through classes, events, workshops and, most importantly, by serving as a model. One of the best ways to educate is to lead by example, thus, we are working to live what we teach. We hope to leave a lasting impact on our students as they graduate and enter the workforce so that they are active and engaged community members--reducing food waste, practicing regenerative urban gardening, and composting are all simple ways to increase food access and decrease greenhouse gas emissions from agriculture. Faculty, students, staff and administrators all work together, across departments, to achieve our goals. Dining helps to coordinate the Food Recovery Network student pickups; students work with Dining staff to collect kitchen waste and other students to participate in compost and garden workdays. Faculty help mentor and oversee many of the operations. Recently, the CSU Chancellor's office help to support the expansion of our program with a Campus as a Living Lab Grant, and we've received other funding from our Campus Quality Fees. Primarily, we have been able to achieve these successes because our campus has institutionalized sustainability, making it a priority for every department on campus. The garden was founded in 2009, and the compost program followed a year later. Over the years, it has expanded. In 2016, we first reached our goal of collecting 100% of our pre-consumer kitchen waste and have continued to do so since then. The Food Recovery Network was founded in fall 2015 and is ongoing. The CSUN Food Pantry was founded in 2016 and is ongoing. The food garden was founded by a faculty member who made a personal donation to support its inception. Additional money was raised through a campus fundraiser, with small amounts given by individuals. These funds allowed us to build more than 400 square feet of raised beds and install drip irrigation. Facilities has contributed in a variety of ways, for example, by helping us acquire an electric cart to expand our composting program, to pay for water and occasional garden maintenance and building projects, and to build our outdoor classroom. Dining contributes $5000 each year to support our composting program and maintenance of the electric cart. The Institute for Sustainability, funded through Academic Affairs, pays student interns to manage the garden and compost facility. We've received Campus Quality Fees from our campus, thus, students are contributing to this project through those awards. Our Chancellor's office recently awarded us a $37,000 Campus as a Living Lab grant to expand our program and to redesign courses that align with the educational mission of our program. More than 15,000 pounds of edible food recovered by the Food Recovery Network More than 100,000 pounds of kitchen waste converted into compost on site Thousands of students have volunteered in the campus food garden and composting program. These students walk away with information about how to build simple, small urban gardens on a budget. Campus faculty, staff and administrators are learning about new ways to reduce waste and food insecurity. Probably the biggest lesson I've learned is patience - processes can move slowly, and perseverance really does pay off. Try to align the changes you wish to implement with other priorities on your campus. For example, recovering food waste and feeding hungry students might not be a priority on your campus, but diverting waste from the landfill may be. Thus, when proposing ideas for change, know how your project meets the needs of other campus initiatives. Finally, start small. I built my first campus garden out of dresser drawers that I found for free on craigslist. Students painted them, and we got seeds from a local seed library. Once the food was growing, it because a showcase for what was possible, and the campus leaders were more willing to help us find space to build a larger demonstration garden.